Behold The Throne: There's A Golden Toilet At The Guggenheim : The Two-Way Museum-goers, prepare for "unprecedented intimacy with a work of art." Starting Friday, visitors will be able to use Maurizio Cattelan's America, a gold-cast, working toilet at the New York museum. Maurizio Cattelan's America goes on display Friday at the Guggenheim in New York. The artist says it is "one-percent art for the ninety-nine percent." Museum-goers, prepare yourselves for "unprecedented intimacy with a work of art." 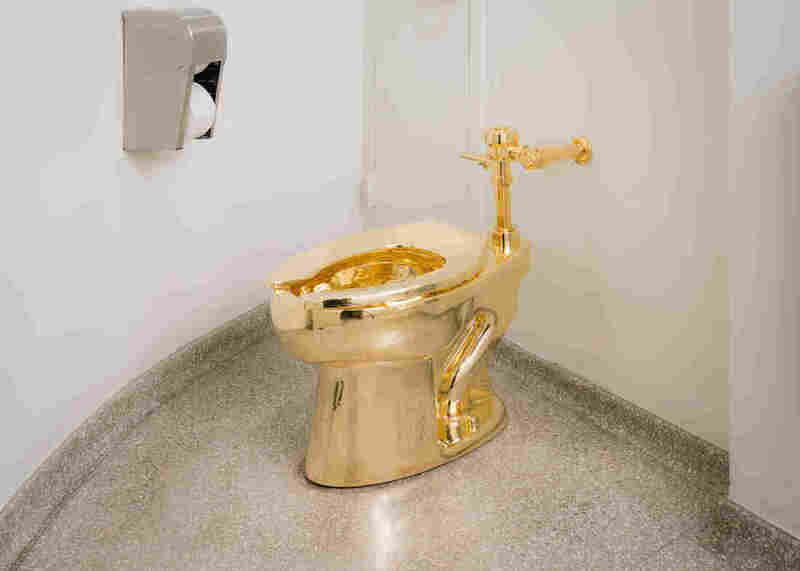 Starting Friday, visitors to the Guggenheim are encouraged to relieve themselves in a fully functional toilet cast in 18-karat gold called America, which will be on display indefinitely. The installation by Italian artist Maurizio Cattelan replaced the toilet in a small, single-unit museum restroom with a far flashier model. "People will most likely wait in line...and individuals will use it one at a time. There will be a security guard outside who will explain to people what the piece is ... And then people will use it as they would a bathroom." The golden throne is meant to be a gesture of provocation, Spector says. "The fact that it is very welcoming, inviting for anyone to use, gets to the heart of a lot of questions around exclusivity in the art world and in museums in particular. And this notion of having a very intimate, private experience with a work of art, and a work of art that speaks quite dramatically about its own value, is fascinating on many many levels," she adds. Cattelan has jokingly termed it the "Guggen-head," according to the museum. The work's title, America, is seen as a nod towards the American dream and boundless opportunity, "at the most optimistic end of the spectrum," Spector says. At the same time, Cattelan has said it is "one-percent art for the ninety-nine percent," according to the museum. "It's a very valuable, ostentatious object that anyone can use," Spector adds. Cattelan says he wants visitors to draw their own conclusions about the message. "Come spend a little alone time with 'America,' and you can ponder that meaning for yourself," the museum said in a blog post. It's not clear how much the opulent toilet cost to make. A gold toilet presents its share of maintenance challenges. Spector says that "it's both a functional object and a work of art, so it presents unique challenges. It's also 18 karat gold so the material has to be treated very carefully." She adds that "our sculpture conservator has done studies on the material and will be using a form of steam cleaning and special wipes. It will be kept clean throughout the day, as the Guggenheim does with all of its bathrooms, but not steam cleaning necessarily." Cattelan has been described as a "provocateur, prankster, and tragic poet of our times." 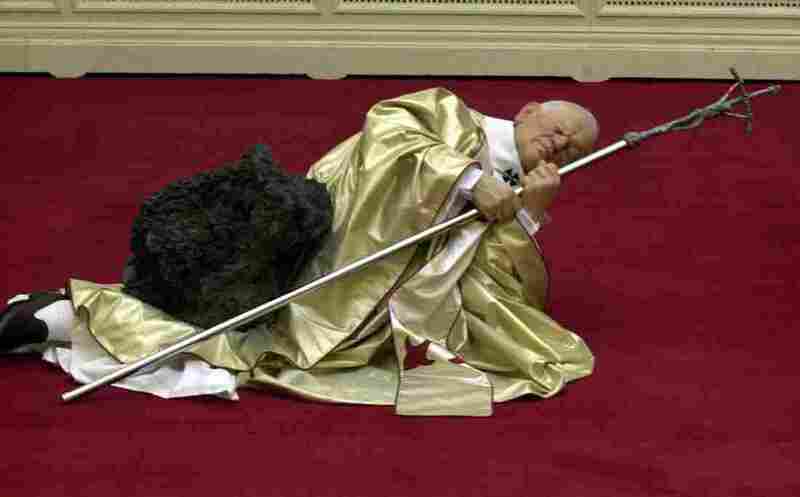 One of his most famous pieces, La Nona Ora (The Ninth Hour), depicts Pope John Paul II lying on the floor after being struck by a meteor. America will likely have a warmer welcome than another famous toilet-shaped piece of art: Marcel Duchamp's 1917 iconic Fountain. 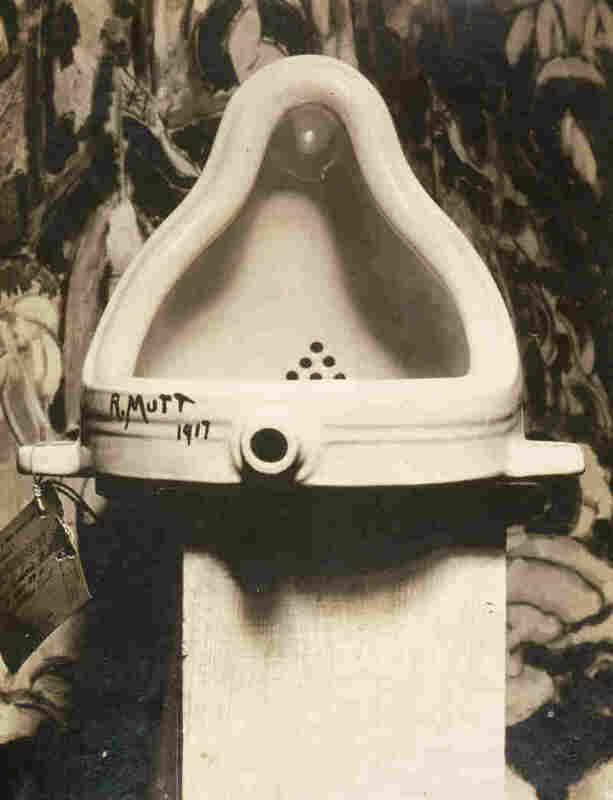 The standard urinal produced by a sanitary ware supplier and signed "R. Mutt, 1917" shocked the art world. Duchamp was suggesting that an everyday item could be considered art if an artist presented it as such — kicking off a century of debate. "[Duchamp] purchased a urinal from a sanitary ware supplier and submitted it – or arranged for it to be submitted – as an artwork by 'R. Mutt' to the newly established Society of Independent Artists that Duchamp himself had helped found and promote on the lines of the Parisian Salon des Indépendants. ... The society's board of directors, who were bound by the Society's constitution to accept all members' submissions, took exception to Fountain, believing that a piece of sanitary ware — and one associated with bodily waste – could not be considered a work of art and furthermore was indecent (presumably, although this was not said, if displayed to women). "Following a discussion and a vote, the directors present during the installation of the show at the Grand Central Palace ... narrowly decided on behalf of the board to exclude the submission from the Society's inaugural exhibition that opened to the public on 10 April 1917."